Some of my family and friends are so hard to buy gifts for because they have everything, or so it seems. I found something that is so sweet for any female friend or relative. 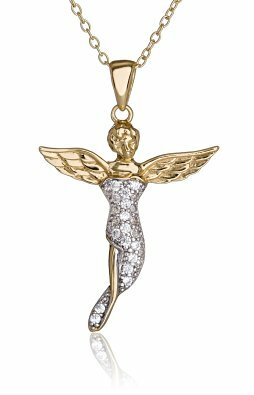 SilverLuxe Angel Cross is a beautiful angel made of sterling silver and gold plated with genuine cubic zirconia stones. It's very delicately featured face makes it unique. I've never seen a necklace quite like it. The 18" chain is very attractive and just the right length. I've never been a fan of big gawdy jewelry and this necklace is simple but beautiful. It's not big and bulky, but elegant and lovely.